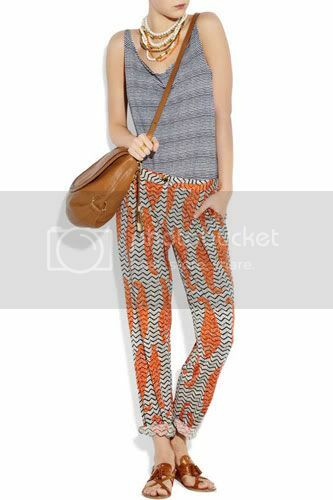 Printed slouchy pants, what's not to like? They're so comfortable and perfect for the perpetual summer that we have here in Singapore. Slouchy pants usually sit nicely at the waist or at the hip and they do wonders for those days when my thighs just don't agree with me. I am assuming that a lot of people stay away from them because they look a lot like... pajama pants. I've had mine for a year and I still don't know what to do with them at times. Fret no longer for I have chanced upon some dress 'em up ideas. Never underestimate the value of accessories. Add some necklaces, chunky ones, long ones, feel free to mix and match. Ethnic jewellery adds an edge to your outfit too. Don't forget your statement footwear! 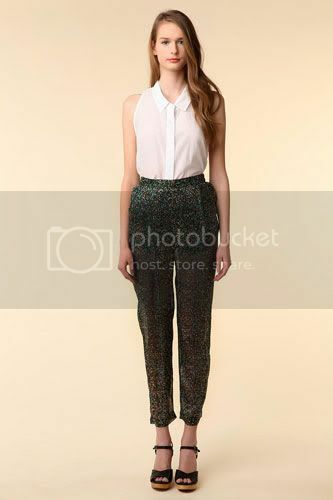 Wear your printed pants high waisted and cinch them in with a leather belt. Tied tees and shirts can be found easily these days so why not go for the entire look? Pair your slouchy printed pants with a sleeveless white shirt tucked in with dainty footwear and voila, you're ready for the streets and the office, instead of looking like you're ready for bed. I am not keen on this suggestion because throwing on a blazer is a lazy way to make an outfit work. That being said, I cannot deny that it has some amazing transformative power. Wear it over a simple camisole with high heels for instant glam. Now, who says I overslept?